When he was an editorial writer for the Philadelphia Record and later the New York Post, Mr. Stone's pungent, clarifying style has already managed to pierce through the wall of anonymity that usually surrounds such positions. At present, as Washington editor of The Nation and a contributor to the newspaper PM, Mr. Stone is acknowledged to be one of the keenest and boldest observers of national affairs in the country. In Washington during the past year, Mr. Stone's interests have chiefly centered in the industrial defense program and the Office of Production Management under Knudsen and Hillman. He has himself studied the details of the novel proposals made to the OPM by such labor spokesmen as Reuther and Murray, and by such alert communities as Beaver County, Pennsylvania. He has watched with concern the Army's and Navy's treatment of the great industrialists who represent and control our vital aircraft, steel, aluminum, machine-tool, and oil production. He has been disturbed by the over-centralization of defense orders, by the under-expansion of plant, by the reign in many sector of "business as usual" in the face of a national emergency. In this book the author gives us a clear factual picture of the effort to date; he sums up a year of improvisation and achievement. But in pointing out the loopholes, the dead spots, and the points at which there is a lack of co-ordination, he also shows how they may be plugged, mended, and co-ordinated. 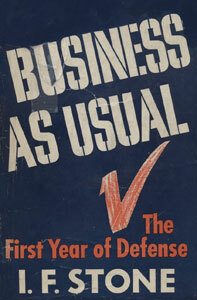 With its graphic illustrations of actual situationsespecially the elaborate treatment accorded to the amazing case history of aluminumthe book is calculated to make every literate American understand what is going on along the defense front, why it affects him personally, and what he as a citizen, producer, and consumer can do about it. Mr. Stone's conclusions are grave in their criticisms but also they are highly gratifying. For they show that the most democratic type of defense is at the same time the most efficient defense of democracy. This is a message that no Americanwhether businessman or workercan afford to miss. "This is the first book to show the way in which monopoly practices and big business control hamper mobilization of America's resources for defense. The statement of the facts in this book is absolutely essential in the public interest." "I hope the American people will read this book before it is too late. It tells the story of the sabotage of national defense by the monopoly practices of big business. But the book also tells us what we can do now to make guns and butter on time for ourselves and our allies. It tells us how we can use industry councils and community pools to make full use of our resources, machines and manpower in the democratic defense of America."